A fun post in the comments from Phillip Mulholland. The Carbonate Beach Factory: Memories of a Warm World. It is a mid-June day in 1991, West Caicos, a small uninhabited tropical island in the Turks and Caicos archipelago, bakes in the hot summer sun. I am on a field trip to the British West Indies organised by Dr Hal Wanless of the University of Miami, to study the modern geology and depositional environments of a natural carbonate factory. A visit that, even now, I consider to have been the best field study trip of my entire geoscience career. Located in the trade wind belt, the Turks and Caicos Islands lie at the south-eastern end of the Bahaman chain of Atlantic Ocean carbonate-platform islands. With the Tropic of Cancer passing to the north of the group, at midday the June sun is directly overhead and your shadow is as small as it possibly can be. By evening, the summer thunderstorms arrive tracking west across the ocean, passing by on their way to the Caribbean. For most of the year, the climate of West Caicos is dominated by dry trade winds. These are derived from the down-welling of the Hadley Cell, centred over the Atlantic Ocean to the north-east. The low rainfall and high evaporation rate make the climate too dry for sugar cane production, a failed economic enterprise tried by past entrepreneurs at this remote island location. Salt production, the original economic activity of the Turks and Caicos, was attempted at West Caicos, but that enterprise failed also. The salt pans were located on the site of a major wash-over fan in the northwest of the island. The regolith here consists of permeable limestone rubble and not the impermeable coastal micritic mudflats, the natural location of choice for salt production on the other islands in the group. This site, with its poor hydrogeology, probably accounts for the failure of the West Caicos salt pan enterprise. Now West Caicos is a nature reserve and the native bromeliad flora are left to grow undisturbed. We are here to undertake a west to east traverse across the island to see how the individual elements of its geology have been created by the natural marine processes of active carbonate deposition occurring over the past few thousand years, since the sea level rise at the end of the last ice-age flooded the Caicos platform. We begin our journey in the sea, swimming with mask and flippers off the island’s west coast; we are here to observe the corals thriving in the shallow warm waters of the reef flat, everyone’s ideal coral island setting. Swimming here is easy in the shallows, except for the slight ocean swell, as we make our way out to the drop-off, and spot the barracuda fish below, patrolling the reef edge, marking its location. Then everything suddenly changes, the seabed disappears from sight as the water depth precipitately increases towards the 300 metre level, the water colour becomes a deep blue and the water temperature drops as we move into the ocean current. Here I experience a sudden cramp in my legs and I am grateful for the life jacket I’m wearing and the presence of my safety buddy, as swimming becomes difficult in the colder water. So why is the water now so cold and where has all the warm water gone? Leaving these questions unanswered we swim to the safety of the Z boat and head back to shore. Our next stop is just off the beach, here the corals are no longer thriving, they are being buried by carbonate beach sand and the burrows of innumerable marine creatures pockmark the seabed. This change to carbonate sand is not evidence of a dying environment, this is a thriving pristine environment, it is simply no longer the coral’s home and a new force of nature, sediment derived from the inorganic carbonate beach factory, dominates the scene. Carbonate geologists estimate that approximately 50% of all the carbonate rock on Earth is generated by inorganic means and our next stop is the factory floor, the sand generating swash zone of the carbonate beach environment. We arrive on the western beach of West Caicos, standing in the swash zone where the sea water reaches its warmest temperature. We observe the continuous back and forth motion of the sea as each wave arrives, rolling the grains of carbonate sand and creating a smooth beach with a distinctive sedimentary pattern or facies. Hal draws our attention to the beach rock in a small cliff adjacent to our landing point. Here we can see, preserved in the vertical rock face and deposited at a time of previously higher sea level, the sedimentary facies of the same near shore environments we have just observed offshore. In the base of the cliff we find the fossil corals, above them surrounding and smothering them we see the lithified carbonate sand grains and the distinctive cone shaped burrows of the long dead marine animals. Above this zone are the smooth layers of sand from the old swash zone forming a structured Z shaped pattern in the cliff face marking the exact tidal limit of the ancient beach. This is a classic geological example of the “Principle of Superposition and Original Horizontality”, where the younger sediments of the proximal shallow-water beach environment extend over the older distal deeper-water coral reef, as the sea bed shallows and the island grows seaward. The effects of this principle are regularly observed in marine carbonate deposits, with each upward episodic sea level change defining the datum for a repeated pattern of sequential stratal growth. We climb off the beach, up onto the rock outcrop and on its upper level we find gigantic boulders of beach rock with the same three strata as below, but tumbled out of their original setting. Hal observes that these boulders have been ripped out from the cliff and deposited up here by a storm surge from a former hurricane. My personal view is that this could be a tsunami deposit, given that we are due north of Hispaniola and at the western end of the active Puerto Rico submarine trench, this explanation of a powerful wave, generated by a submarine earthquake, also seems plausible. It is my belief that in geoscience it is always a good idea to entertain more than one explanation for any set of field observations. We are now standing at the top of the cliff, above the sea, on the oldest part of the island. Turning to face east, we see the land fall away in a gentle slope and in the distance, on the horizon, a line of sand dunes rises behind a blue lake. Following a straight track, laid out by the former sugar plantation enterprise, we are soon down hill, back at sea level, walking out on a causeway across the brine lake. Half way across there is a break in the track, the site of a former culvert, where the lake water flows though the causeway gap from north to south. Hal explains that on every visit to West Caicos he has always observed the same continuous direction of flow, so a tidal explanation for the movement of the water can be discounted. The lake occupies the site of an old bay on the island’s former east coast, now separated from the lagoon by lines of barrier dunes, but its waters are still hydrologically connected to the sea by an underground phreatic limestone aquifer. The wind driven marine current flowing west towards West Caicos island across the shallow Caicos lagoon creates a hydraulic gradient on the islands east coast that forces sea water underground, through the island’s limestone core to emerge in and flow through this central blue lake, before the water makes its way back underground to regain the open sea at the island’s west coast. Beyond the lake the track rises to a cut through heavily vegetated small hills, the maturity of the bromeliad flora demonstrates the significant age of these now inactive dunes. At the crest line, a new vista appears, in the distance a second line of modern sand dunes lies beyond a sabkha mudflat. We descend and cross the sabkha, its fragile algal crust breaking under the pressure of our footsteps, to reveal soft gypsum mud below. The presence of natural gypsum (hydrated calcium sulphate) in this ocean island setting is a surprise and is a testimony to the effectiveness of the high evaporation rate of the West Caicos climate in concentrating the seawater brine. Leaving the sabkha we climb the line of modern dunes, the loose sand and the sparse vegetation of grasses demonstrate the young age of this second barrier to be crossed before we reach the modern east coast of West Caicos. Beyond the crest, a rapid descent brings us down to a wide wind swept beach. A continuous drying wind, blowing in our face, moves the loose sand off the shore, adding to the dunes behind us and raising the island’s surface above sea level by means of aeolian sedimentation. It is now over 19 years since that summer day, yet the memories of my short visit to West Caicos remain vivid. Looking back now, at the end of my geoscience career, it is time to place all the elements of that day into an environmental synthesis and answer the question of what happened to the warm water when I swam beyond the reef edge and experienced that dangerous cramp in the cold waters of the Atlantic Ocean. Marine inorganic carbonate sediment creation is a warm-water, shallow-sea process. There are two major types of carbonate environment present in the seas of Earth; namely carbonate platforms and carbonate ramps. Carbonate platforms are found throughout the tropical oceans, while carbonate ramps are found on continental shelves in tropical epiric seas. The Caicos Islands are an example of a modern active carbonate platform that forms an area of shallow sea surrounded by the deep waters of the Atlantic Ocean. The dimensions of the platform are large, in the south it extends from West Caicos to Seal Cays, a distance of about 100 km, while in the north it extends from Providenciales to East Caicos a distance of about 80 km. The platform covers an area of approximately 5,400 sq km, of which only 430 sq km is land and about 5,000 sq km is covered by shallow sea. This shallow lagoon is a gigantic solar energy collector, each day the tropical sun warms the sea water and all day and night the dry north-east trade wind enhances the surface evaporation, increasing the sea-water salinity and driving the current westward across the lagoon towards West Caicos and the open ocean beyond. As the temperature and salinity of the ocean water increases in the lagoon a process of evaporitic precipitation of salts from marine waters becomes possible. This deposition of salts occurs in a distinct pattern of increasing solubility. Calcium carbonate, the least soluble salt, precipitates first. The water soluble calcium bicarbonate is converted to calcium carbonate precipitate with the release of gaseous carbon dioxide to the atmosphere. This process takes place in the warmth of the beach’s swash zone and accounts for the prolific carbonate sand sedimentation found here and throughout the Bahamas. The next salt that precipitates from the seawater concentrate is gypsum (hydrated calcium sulphate). This process takes place on the West Caicos sabkha, behind the dunes, where the ponded seawater, driven onto the island by the wind and tide, concentrates by further evaporation. The third salt to precipitate is halite (sodium chloride) this is the most soluble mineral of the three and therefore the most difficult to precipitate. The waters of the brine lake demonstrate that there is the potential for this process to occur on West Caicos, and would do so if a suitable natural salt pan existed here. Halite deposition does occur on other islands in the group that have more favourable environmental conditions, such as the islands of Providenciales, North, Middle & East Caicos on the northern rim of the Caicos platform. These islands are all growing by natural tide assisted sediment accretion of carbonate mud. They have mangrove swamps on their southern coasts and are slowly extending out across the Caicos lagoon. Behind the zone of mangroves, the drying wind and hot sun permit the deposition of gypsum and halite in flat natural salt pans. As a consequence of the process of evaporation the sun warmed sea waters leaving the Caicos lagoon, on its western margin, are denser than the cold ocean waters that have flowed around the carbonate platform. At the reef edge this water density difference causes the warm lagoon brine to sink towards the depths below the colder less saline ocean water and accounts for the sudden thermal contrast I experienced in the sea off West Caicos island that June day in 1991. This entry was posted on August 9, 2010 at 7:38 pm	and is filed under Uncategorized. You can follow any responses to this entry through the RSS 2.0 feed. You can leave a response, or trackback from your own site. Just so. When CO2 dissolves in the sea, most reacts with dissolved carbonate to form bicarbonate. This reaction is reversible, and is being reversed here. The bicarb splits into carbonate and CO2 again, and in this environment the carbonate precipitates and the CO2 returns to the air. I really enjoyed the essay. It reminded me of the Tony Brown posts on historic ice record in the arctic. Sometimes it’s good to step back and remember what we’re talking about. Great essay. Unfortunately West Caicos isn’t quite so pristine anymore. In two successive years I spent two weeks on Providenciales to the East of West Caicos. I was on the beach in Sapodilla Bay with a view across the water to West Caicos, which looked like one giant erector set with cranes towering over the island’s east end. There was a long dock on our beach that was crowded with workers in the early morning as they boarded launches to take them to West Caicos. Then the global financial meltdown (Lehmann Brothers was financing development) brought all construction to a halt in 2008. I haven’t been back in a couple of years, but I don’t think things have resumed. So there are these great hulking concrete shells standing unfinished. Bishop Hill references McKitrick’s review of the Climategate reviews. Field trip to the Turks and Caicos…rough life. Brazilian automakers make vehicles will be flexible with gasoline and ethanol blends. Ethanol from sugar cane in Brazil has been created in the twenties and thirties, with the introduction of the car. Output fell by the wayside until the seventies when oil again threatened. At that time ninety-seven percent of ethanol produced in the United States is from corn. There are no current plans to produce ethanol from sugar cane or beet sugar in the United States. Brazil and the US are not comparable. ‘Cane grows like a weed in Brazil’s climate, but is only viable in the southernmost portions of the US. And using corn inevitably displaces food tillage, and spikes prices. With disastrous results in the poorest parts of the world. Further, the inputs and fertilizers etc. required by corn make it a marginal or losing energy proposition. Finally, it would take virtually every habitable and tillable acre in the country planted in corn to replace gasoline. The above “Tim” post is generic robo-spam. I think it is the real tim who really liked the wonderful post. Don’t click on the name though, it is linked to something horrible. There is no tim. It’s a spambot posting generic messages clumsily phrased to exploit the vanity of bloggers of lesser intelligence, and thereby avoid blocking or deletion. I was joking with you. I get literally thousands of these every month. 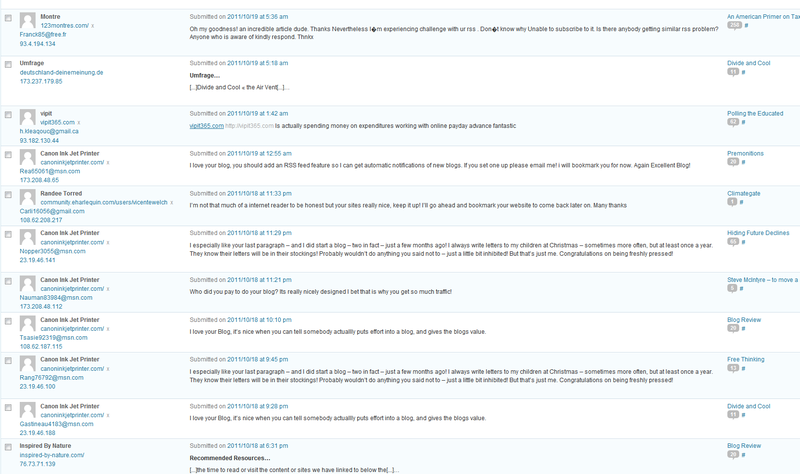 Just for the heck of it, I did a partial screen capture of the spam filter today. Looks like you were right :D.
219672 spams in 3 years. Sorry to hear that West Caicos is no longer the pristine nature reserve that it was in 1991. I notice from Google Maps that there is now a landing strip on the island. Yes it was rough. Back in the office, one colleague would not speak to me for months afterwards. West Caicos was only one day of a week on the islands that included a Cessna flight round the archipelago. On that day the pilot took one look at the satellite image that our remote sensing department supplied for our visit and commandeered it because it was the most accurate map of the Turks and Caicos that he had ever seen. It made his job of navigating to the Blue Hole easy.